On 11 January 1916 the Battersea Local Tribunal met to consider cases for the first time. Present at the meeting were the Mayor, W J Moore, who was chairing, W Hammond, H G White, W Watts and A Winfield, as well as military representative Captain Briggs and his deputy Lieutenant Jones. 37 men who had attested (meaning they had an obligation to come if called at a later date) were applying to be placed in a later group or were in a reserved occupation. Call up was done in groups, with the lowest numbered groups being called up first, so being placed in a later group gave more time to make arrangements at home if required. There were then 46 more claims which the Military Representative objected to for some reason. Of those 46 claims, the Tribunal agreed to defer 9. One claim was withdrawn, that of Fred Fordy. He was a greengrocer’s assistant at S J Smith, 158 Battersea Park Road – the application to the Tribunal was actually made by his employer. 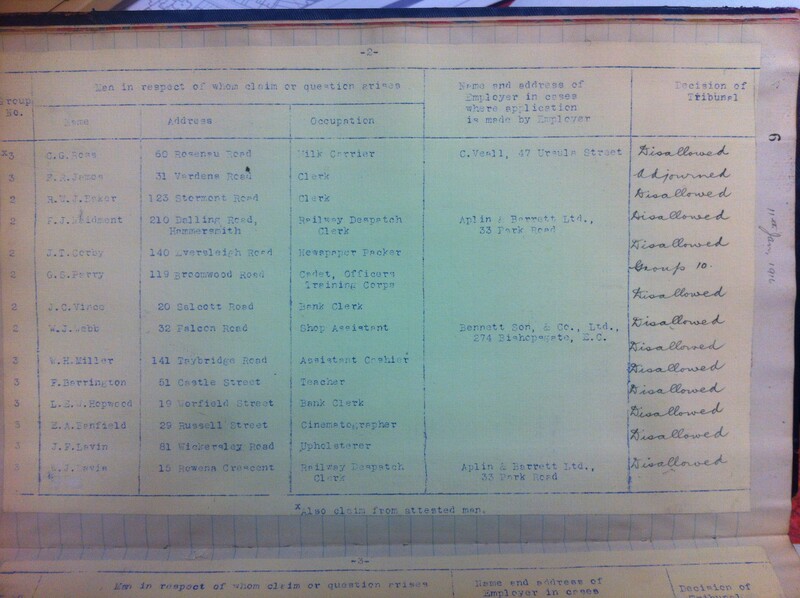 Fordy was 18 and had been working for Smith since he was 14, possibly earlier, as he is listed as a greengrocer’s assistant on the 1911 census. He was killed in May 1917 and is recorded on the Arras memorial. George S Parry of Broomwood Road was one of those deferred to a later group, possibly because of his occupation – which is listed as a Cadet with the Officers Training Corps. He was put into Group 10, which was mobilised on 29 Febuary 1916 – in his case, as part of the local 23rd County of London regiment. Sadly he was killed in September 1916, just a few months after mobilisation. Of the four cases adjourned for a later decision, three claims were placed in later Groups the following week, and the fourth case a week after that. None of the claims were successful, and the Tribunal passed un-reported in the local newspapers (although later Tribunals are reported in detail, and we will come back to the Tribunal in future weeks). As is clear from this the majority of the appeals were “disallowed”, a pattern which is maintained throughout all the Tribunals. There did not seem to be any difference between the 18 men whose employers had made the application and those who made it themselves – they were just as likely to be unsuccessful. Several of the men came from outside Battersea, including one from Hammersmith, one from Hounslow and one from Croydon. All of them worked for Battersea employers, F J Maidment was a Railway Despatch Clerk for Aplin & Barrett Ltd (a dairy on Parkgate Road, then known as Park Road), but resident in Hammersmith. S J Finch was a butcher from Hounslow, who worked for F North on St Johns Hill and L J J Wright came from Albert Road, Croydon every day to work as a clerk for CGT Butler’s insurance brokers on Northcote Road. All of them appear to have survived the war, as it has not been possible to match them to records on the Commonwealth War Graves Commission site. 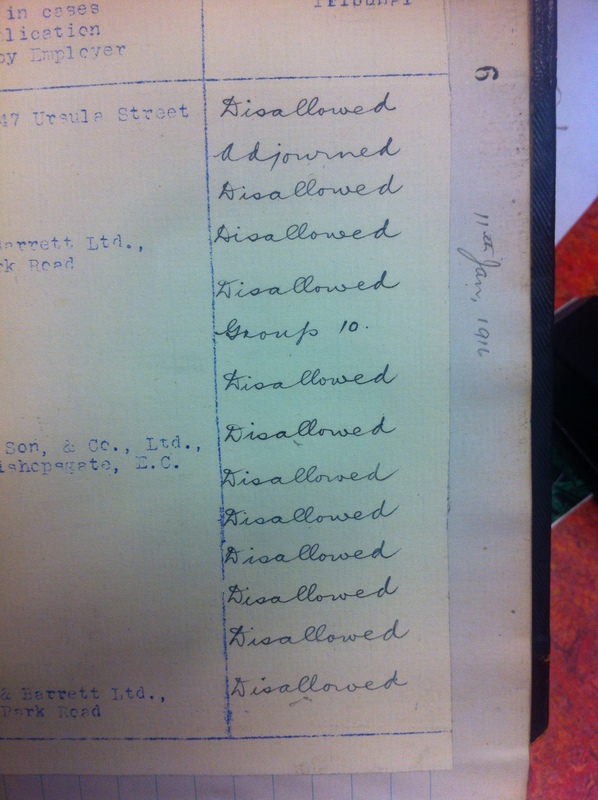 The Tribunal does not record their full names, and none of them are easy to trace on the 1911 census either.